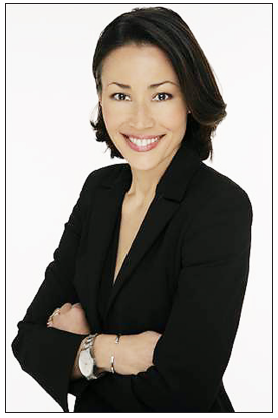 Nearly two years since her fabled departure as co-host of NBC’s “Today Show,” Ann Curry has emerged as America’s most likeable newscaster of color and is ranked among the top five best-known personages in her field, a recent survey reveals. The Q Scores Company, a New York-based firm that measures familiarity and appeal in the news, sports, and entertainment industries, surveyed more than 1,800 viewers. Findings were reported by Tony Maglio, writing in The Wrap, a Hollywood trade publication. “But beyond that, having risen through the ranks at a time when it was reason to worry whether there was even a place at the table for someone who looked like me, I am so pleased now for all who have been coming up the hill,” Curry added. Curry outshines both O’Reilly and Morgan in likeability. The two are ranked 15th and 16th, respectively, while Curry is listed in eighth place. Scott Pelley of “CBS Evening News” tops the likeability poll but is ranked well below Curry in terms of familiarity. Other non-white newscasters who made the “most likeable” list are NBC’s Tamron Hall (11th), CNN’s Michaela Pereira (14th) and Dr. Sanjay Gupta (20th), and MSNBC’s Alex Wagner (23rd). Born in Guam, she is the daughter of Bob Curry and the former Hiroe Nagase. She attended school in Japan and began her broadcast career after graduating from the University of Oregon. She moved to Los Angeles to become a reporter for KCBS-TV and won two Emmys for the station. Curry recalls that she “loved to read” The Rafu when she lived in L.A. from 1984-1990. She joined NBC News in 1990, first as the network’s Chicago correspondent and then as anchor of “NBC News at Sunrise.” In 2005, she joined Stone Phillips as “Dateline NBC” co-anchor while continuing as co-anchor for “Today.” She earned acclaim for her coverage of global humanitarian crises in Baghdad, Sri Lanka, Rwanda, Albania, and Darfur. She replaced Meredith Vieira as a full-time anchor for “Today” in 2011. Curry left the show in June 2012 when she was reassigned by NBC during an awkwardly handled shakeup involving co-anchor Matt Lauer. In September 2013, Jack Mirkinson of the The Huffington Post reported that Lauer’s likeability rating had dropped by 25 percent. Maglio wrote in February’s The Wrap that Lauer’s rating plummeted to 7, compared to Curry’s 13. On April 6, Curry launched a multi-part series, “Our Year of Extremes: Did Climate Change Just Hit Home?” Through interviews with scientists and eyewitnesses, she looks unflinchingly at the links between recent extreme weather events and climate change.